Recently re-issued with all manner of groovy bonus tracks, demos and such, Amazing Disgrace still stands as a fine addition to their catalog and serves as something of a snapshot of mid 90s "modern rock" stylings. 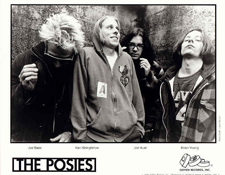 The Posies rode that fine line between what was (at least at the time of this release in the post-Grunge era) known then as "modern rock" yet fitting into the realm of so-called "power pop." Some might lump them in the "alternative" category. Titles are such a nuisance and the need for the music industry to categorize artists like this frustrates sometimes. And its at that juncture where I think an opportunity was missed relative to Amazing Disgrace. That recording echoes The Everly Brothers by way of The Move (for me at least it did, particularly "No Time" from their 1971 swan song Message From The Country). And I hear maybe an early-ish Bee Gees influence in there ("Melody Fair" or "Lamplight" from Odessa perhaps, I don't know... but I think you get the idea I'm getting at here...). Its a beautiful song. So, while that acoustic version's exclusion from this new two CD deluxe edition of Amazing Disgrace was initially perplexing to me that should not imply that this reissue is bad or anything -- no, it is good! And if you're a fan of the band you probably should get it because it sounds and looks real fine (once again Omnivore Recordings has done a great job on this reissue). Across two CDs you get lots of cool bonus tracks, demos, alternate mixes and the like. As CDs go, the remastering is pretty nice as well -- all those good things to help you justify buying a favorite album again. There are some terrific tunes here on Amazing Disgrace such as the rocking album opener "Daily Mutilation." I also love the blunt drive of "Everybody Is a F____g Liar." "The Certainty" brings the focus back to that beautiful harmony thing The Posies have in their back pocket at all times. "Song #1" also underscores the epic underpinnings of some of their music (clocking in at more than five minutes) and setting up my favorite track closing the album pretty well. You can find Amazing Disgrace up on Tidal streaming in CD quality (click here to jump to it) You can find the Adventure Club Sessions CD for sale on Discogs (click here) but I have yet to find a streaming version. 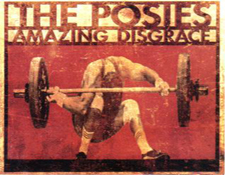 And in case you missed them I previously reviewed the deluxe edition reissues of The Posies' prior albums including Dear 23, Frosting on the Beater and Failure (click on the titles there to jump to the reviews). Ok, I'll stop already. 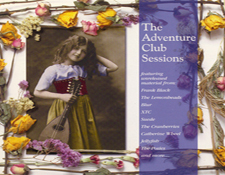 I still own The Adventure Club Sessions compilation so I can always hear my favorite version of my favorite Posies song after listening to this nice Deluxe Edition of Amazing Disgrace.